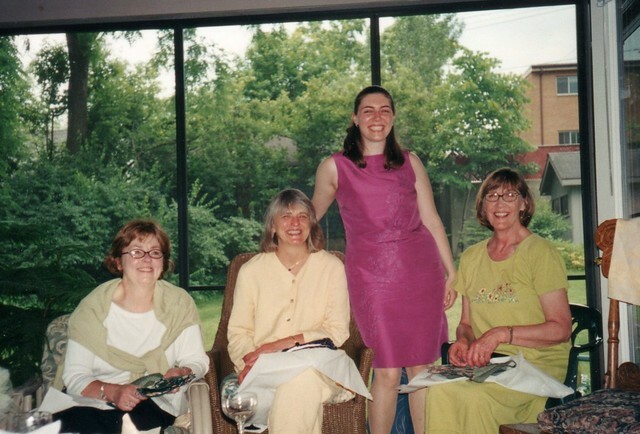 On Sunday, June 10, 2001, I was the special guest at a brunch bridal shower hosted by some of my mom's best friends, at the home of Michael and Lucy Miller, in Ann Arbor. Then and now, I was struck by how amazing these women were, and how lucky I've been, to have had them in my life since I was little. They were not surrogate mothers, nor did I think of them as Aunts. They were, and are, the central network of my lifelong extended family, our closest friends. As long as I can remember, their homes and hearts have been open to me, and I have learned how to treat and get along with others, how to joke, play, dance, discuss, and live life, by their example almost as much as from my own parents. According to my journal, the hostesses were Lucy Miller, Cathie Dries, and Edi Bletcher, and guests present included myself, my mom, Anna Miller, Sandy and Anna Krecic, Penny McDonald, Tanja Vandervoo, Noel Winkler, and Suzanne Taylor. My friend Ann Cheng also attended, who had driven over for the weekend with me from Waterloo, Ontario, where I was still finishing my master's degree. My journal also makes note of the food: Cheese and bread and wine and water, and then a delicious lunch of pasta (angel hair, w/pinenuts, artichoke hearts, garlic, mini zuchini slices, fresh dill w/oil & vinegar & lemon juice), grilled turkey breast (marinated in Montreal steak sauce, grilled by Tom Bletcher over hickory & cedar chips), fancy breads, and a dark greens salad. Lucy also put out a plate of pea pods and cherries, which looked pretty, with sesame seeds scattered over the peas and the cherries around the outside. And for dessert Cathie had made a cheesecake. That was served with fresh blueberries and raspberries and kiwi on top and on the side with optional raspberry sauce. After lunch was presents, and they had me tell everyone how I knew the person whose gift I was opening. After general presents I got a recipe book, which included recipes from people who couldn't come, like Pat Hackley. Aimee McDonald was "reportedly in Chicago at the gala opening of Davy Rothbart's new magazine and couldn't come, but she sent a card which I'll have to re-read later 'cause it made me cry." I have been through a divorce and many moves since that lovely Sunday, and let stuff go with each of those events as well as when I merged my life with Brian's. I no longer have all of the gifts from this event, but I still have that recipe book. Including a very spicy recipe from Aimee that warns the cook to be careful not to catch the kitchen on fire with the spicy hot oil. :) As you can tell from that book, and from what I wrote in my journal, they also helped teach me a love of food, and of sharing it with others. I am so very thankful to have all these women in my life. I simply cannot express how much it means to me.